Ten years ago, this wine would have been terrible and Star Trek fans would have bought it anyway. Perhaps its terribleness would be a selling point; a Klingon pain ritual for the palate. But the California wine industry has advanced technologically. On stardate 47634.44, actual bad California wine is hard to find. It's just a question of whether a wine suits your personal taste. I expected going in that this wine would not suit my personal taste. But this isn't about me. I'm a wine geek; I'm not the market for it. The question is, does Klingon Bloodwine deliver the experience it promises? 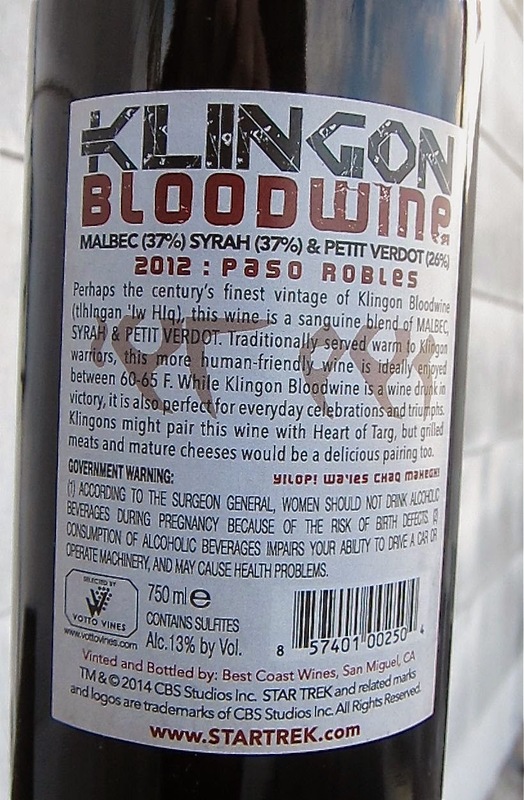 What's surprising about Klingon Bloodwine is that it's not rich, heavy and powerful. In fact, it's only labeled at 13% alcohol. I'm no innocent; I know supermarket wines have their alcohol reduced, either by spinning cones, reverse osmosis or just adding water. Most wineries hide this but I thought Klingon Bloodwine was a rare opportunity to discuss technology. Wouldn't a Star Trek fan appreciate the wine even more if she knew centrifugal force was used to separate out some alcohol? It's like an early-stage transporter. 'So the final abv is actually 13.4 which seems more appropriate. There was an initial brix adjustment at harvest but no technical filtering afterwards.'." Hmm, an "initial brix adjustment at harvest." Sounds like watering to me. Which is fine, a lot of overripe wines would benefit from a little watering. But this wine doesn't taste or smell overripe. 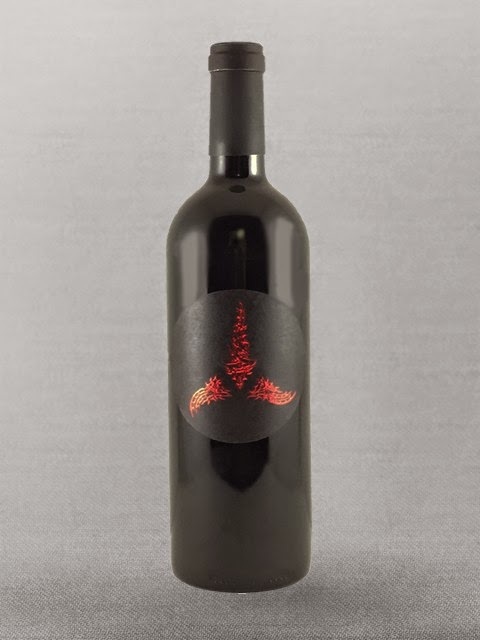 Klingon Bloodwine is a blend of 37% Malbec, 37% Syrah and 26% Petit Verdot. That's a pretty random group that makes me think the producers, a private label company called Best Coast Wines, found these three batches of wine and put them together. Which is fine, we're not talking about Cheval Blanc here, it's Klingon Bloodwine. But again, it's surprisingly light. The color is the medium-red of a California Pinot Noir. The nose is all right; some dark fruit, a little savoriness. And it's all right on the palate as well: it's thin bodied, but has decent dark fruit. In taste, it most reminds me of an adequate $9 California Cabernet Sauvignon. There's nothing wrong with this wine. Perhaps the relative lightness of it and decent acidity make it better for downing at a party. You don't need a food pairing for this, because it's not made for dinner. It's made to bring to somebody's house and say, "goSlIj DatIvjaj! I brought Klingon Bloodwine! nuqDaq 'oH puchpa''e'?" The wine sells for $20 online here, and the PR agency, Colangelo & Partners, says it will soon be available at retailers across the United States. Is it worth $20? Perhaps. It tastes like an adequate $9 wine, so you're paying $11 for the cool label. Let's be honest, a heap of wine, at all quality levels, is like that. You didn't think Screaming Eagle was worth it for the wine alone? yIDoghQo'! I'll bet your mother has a smooth forehead. Blake, I ended up with the Gorn for Secret Santa. Do you think this wine will please him? I hope so. I know what he is capable of when angry.